Mastering crucial confrontations requires a specific skill set. In Crucial Confrontations, consultant Kerry Patterson and executive coach Joseph Grenny join forces with their fellow researchers and trainers Ron McMillan and Al Switzler to help others develop the skills it takes to resolve the most pressing problems, including quality violations, safety infractions, cost-cutting mistakes, and medical errors. The authors write that their research shows that most organizations are losing between 20 and 80 percent of their potential performance because they have not mastered crucial confrontations. 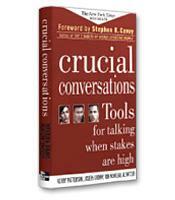 Crucial Confrontations won the 2004 Harold Longman Award as Soundview's Best Business Book of the Year. How to describe problems in ways that don't cause defensiveness. How to motivate others without using threats. How to deal with violated expectations without harming relationships. How to talk to your direct reports face to face when they don't live up to a commitment. How to help others want to take action.